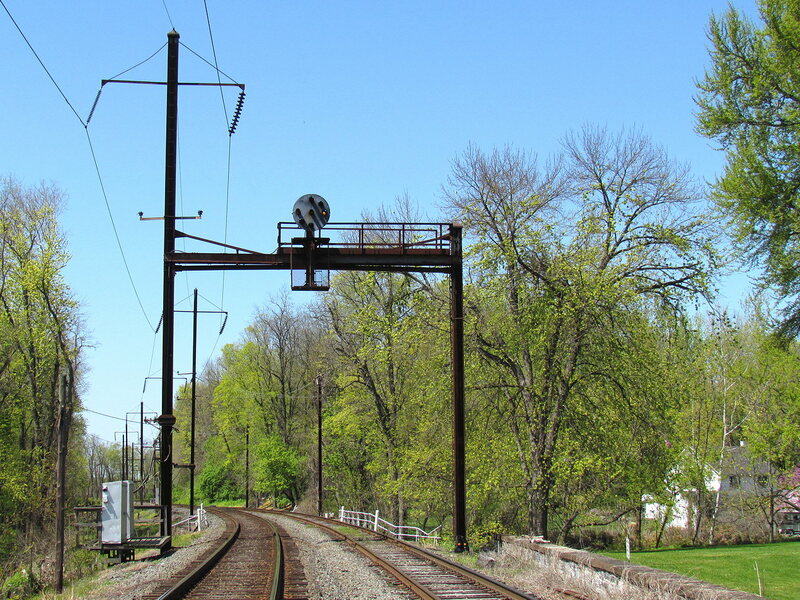 While not technically on the Port Road / Enola Branch between Perryville, MD and Enola, PA, JEB interlocking is located on what is now known as the Royalton Branch, but was part of the larger COLA CTC project and tightly coupled with the subject of the last installedment of Port Road Trips, SHOCKS interlocking. CP-JEB was actually a late addition to the 1938 COLA CTC project that stretches from the Port Road / A&S Junction at PORT and CRESS to the Enola Branch / Royalton Branch junction at SHOCKS. Change came to the Columbia Branch in the late 1957. 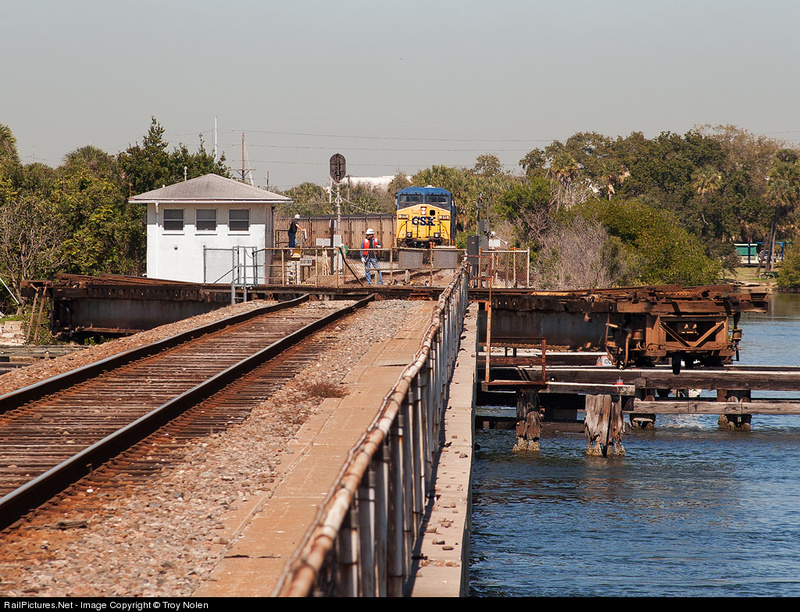 With traffic levels falling there was no need for a two-track freight line on each side of the river so even the mighty PRR was forced to economize, changing a plain Jane two track Rule 251 line into a single track Rule 261 line. ROY interlocking was rebuilt with remote control to STATE tower and at the southern end the former westbound track was converted into a 2.3 mile long passing siding, which two this day is the only one on the line. The west end of the siding was capped by a new interlocking named JEB with control integrated with the existing US&S CTC machine at COLA. 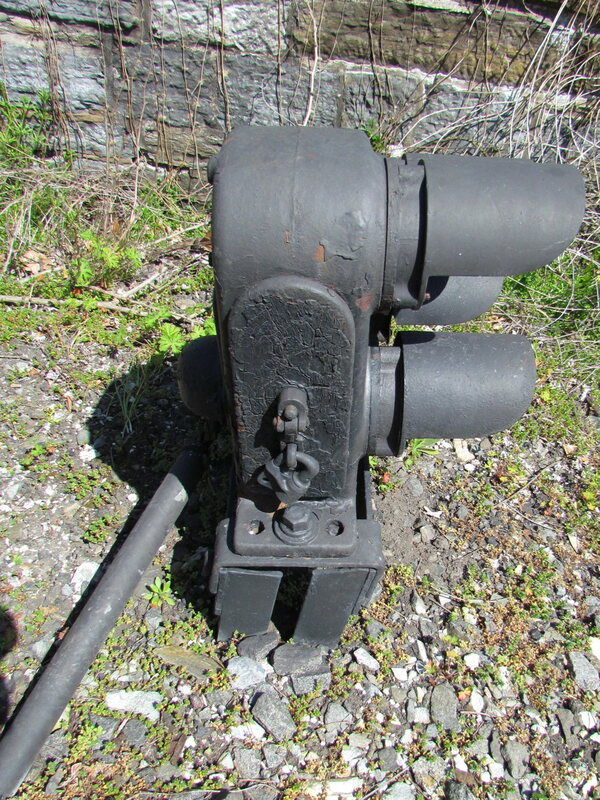 Three unit levers were added onto the SHOCKS end of the machine, 120 for the signals, and 119 for the single switch. Traffic was worked from STATE via the 16 traffic lever on the ROY machine. With only 2 levers for switches and signals CP-JEB is a pretty simple affair. Westbound there is a high mounted signal on a catenary gantry with a dwarf heading off the siding. 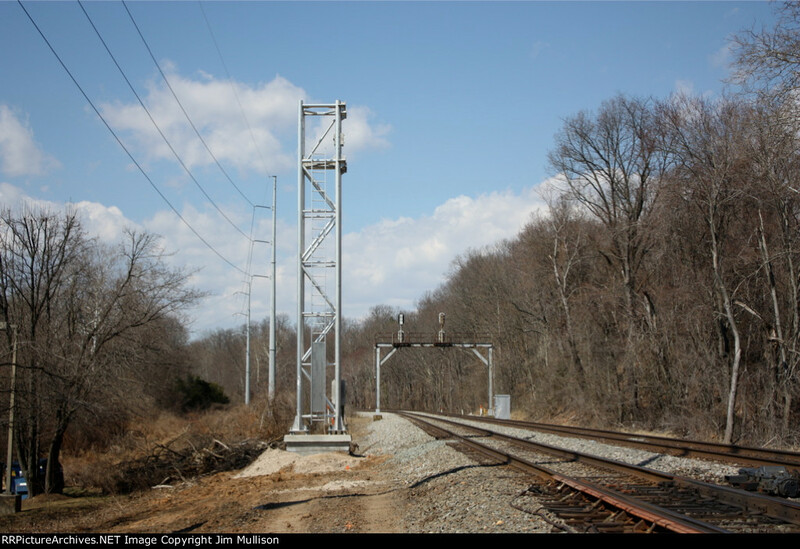 Eastbound there is a single catenary pole mounted signal that serves as a distant to SHOCKS. The siding is not track circuited and therefore all movements into it take place at restricted speed. 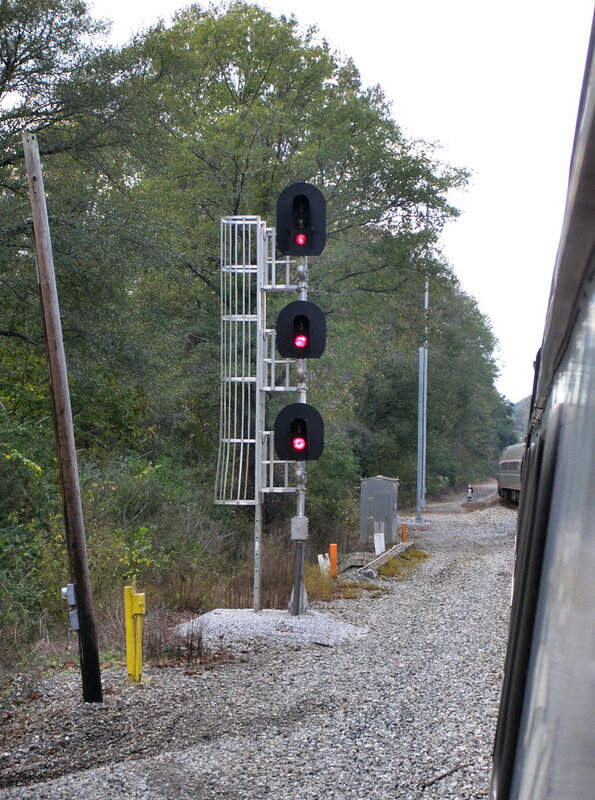 While the interlocking is considered unresignaled, NS did take the step of removing the Stop and Proceed marker from the westbound high signal in an effort to simplify the CTC logic. The exit dwarf is of the rare left handed type. These were common on 1930's PRR interlocking prokects, but were redesigned sometime thereafter to make the Restricting \ smaller than the Slow Approach /. Another difference of the modern design is the use of two small access panels on the sides of the dwarf unit as opposed to a single removable rear housing. 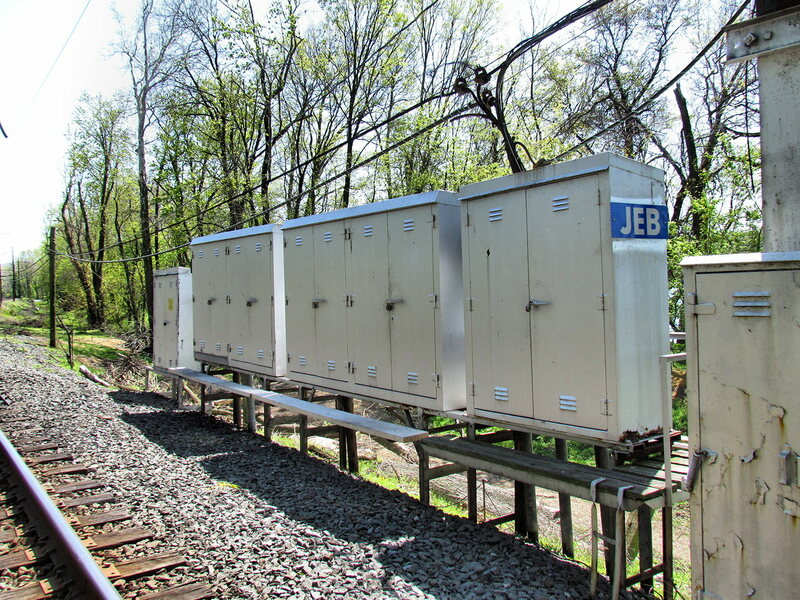 Another unique feature of CP-JEB is that it is a "cabinet interlocking" as opposed to the much more common "hut interlocking". This is another cost saving measure where relay cabinets are used for vital interlocking logic as opposed to full relay huts or bungalows. In the 1950's CTC relay huts were either cast concrete or some other form of constructed house. Use of field cabinets shows the economies of the project. Part of the original CTC pole line is either still in use or at least not torn out yet. The 1938 electrification project would have replaced the open wire pole line with the naturally wrapped bundled style seen here. It's news time again and I have a mix of good and bad news this time, which I guess is better than just all bad news. 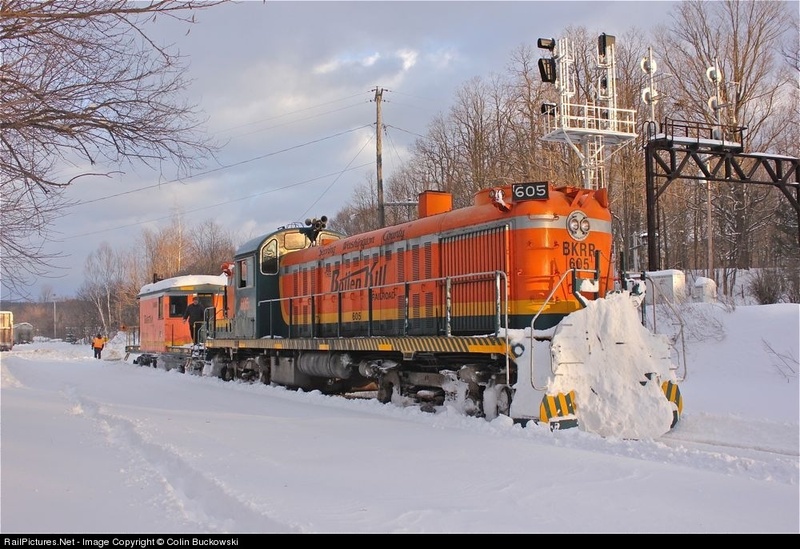 First up the CSX re-signaling project in the Bailey's Wye area was supposed to be completed over the President's Day weekend, but do to the crazy amount of snow that schedule has slipped back until May so everyone has another month to get their final photos in. On the other side of the Potomac it looks like NS is doing some signal replacement on the Southern Main in the VRE Zone, although the extent of the work is not quite apparent. 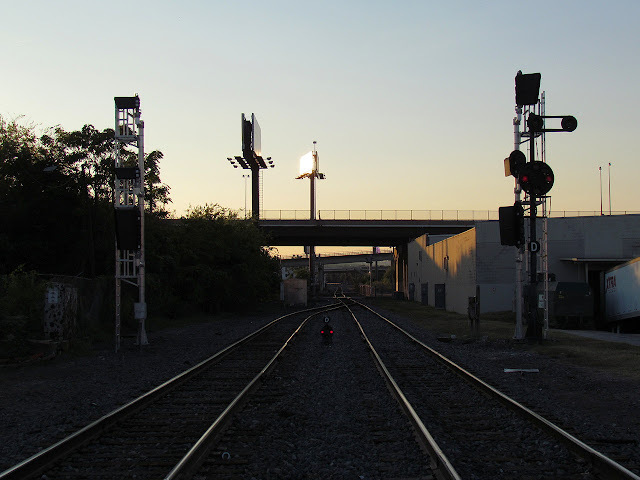 What I do know is that NS is replacing the northbound Southern style signal gantry at BURKE interlocking in such a manner as to improve the sight lines. As you can see the new cantilever is about 400 feet farther away from the curve than the old signal. 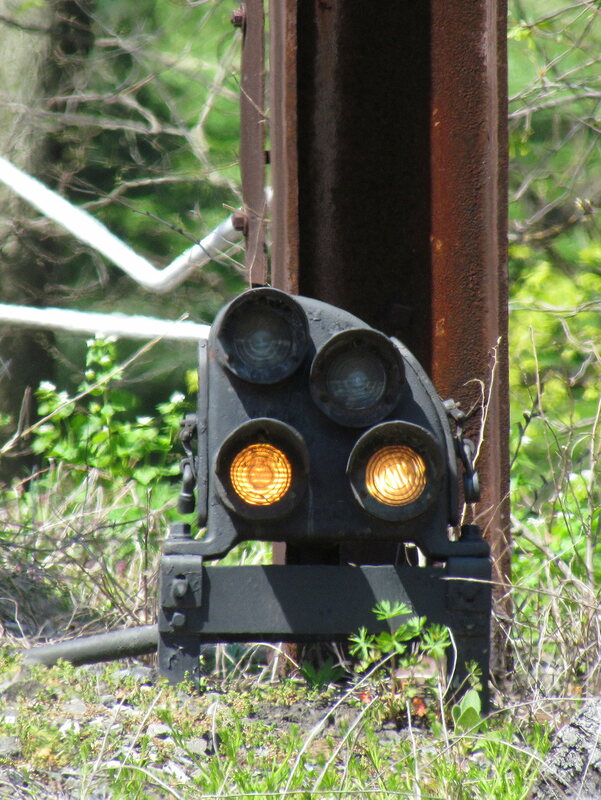 BNSF is continuing to replace its lightly used searchlights in Kansas. Perhaps the biggest tragedy is that the mystery searchlights at Eagle Bridge Junction are on track to be replaced by the Guilford Rail System's ultra cheap brand of Darth Vaders. I had this on my list of locations to document in February, but car trouble caused me to shelve it in favor of CPF-480 (which I figured was more endangered) and it was about a week later when I saw this photo. Yay for the bracket mast I guess. If anyone can get out there this would be a top priority to document. Back to the good news WILLOWS tower in East St Louis got a nice new coat of siding so you can say goodbye to the old asbestos shingles. Inside is a super classic GRS/Taylor Model 2 interlocking machine. Finally I believe I have located what would count as another Active Interlocking Tower on the CSX Palmetto Subdivision Gibsonton, Florida. Like the other recent finds this one is also a bridge cabin and this one comprises a swing span over the Alafia River. Now a trip to the timetable did not definitively prove that this cabin maintained the requisite control over local switches and signals, but it is manned 24/7, is still equipped with classic SCL signals and is not in any sort of signaled territory so I say it is likely to still have local control and be run by an operator. The Southern Serves the South and today it is serving my need for a blog post.The Southern is interesting as it is the most Western of the Eastern Railroads in terms of its signal indications, yet still retains a number of very Eastern elements. Until recently the South was a fairly laid back rail environment compared to the corridor running between the Northeast and Chicago. 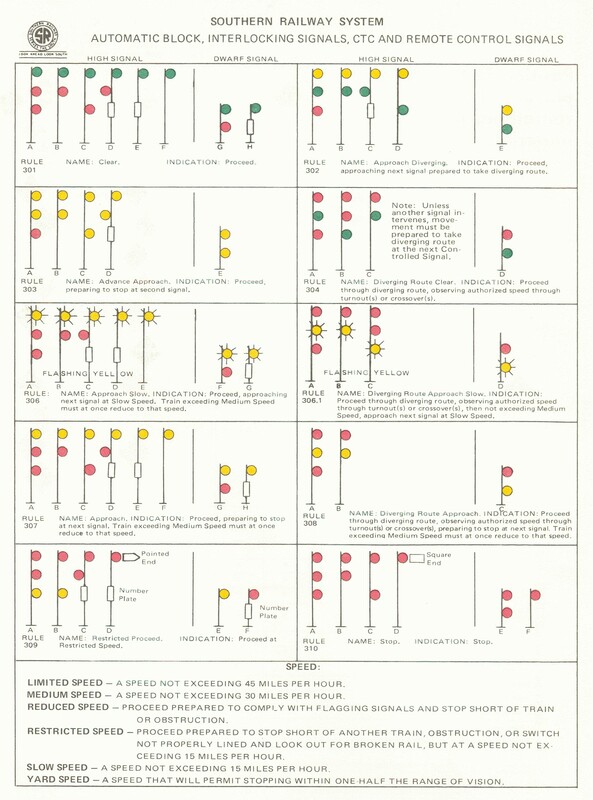 With large amounts of single track ABS and little need for interlockings away from major junctions and station terminals the Southern was able to get by with a total of 10 signal indications vs 21 under NORAC and similar numbers on the CSX systems. As you can see the Southern was a route signaled system which means that all the very specific Speed based signals just get tossed right into the bin and replaced with "Prepare o Diverge", "Diverge to Clear" and "Diverge to Stop". 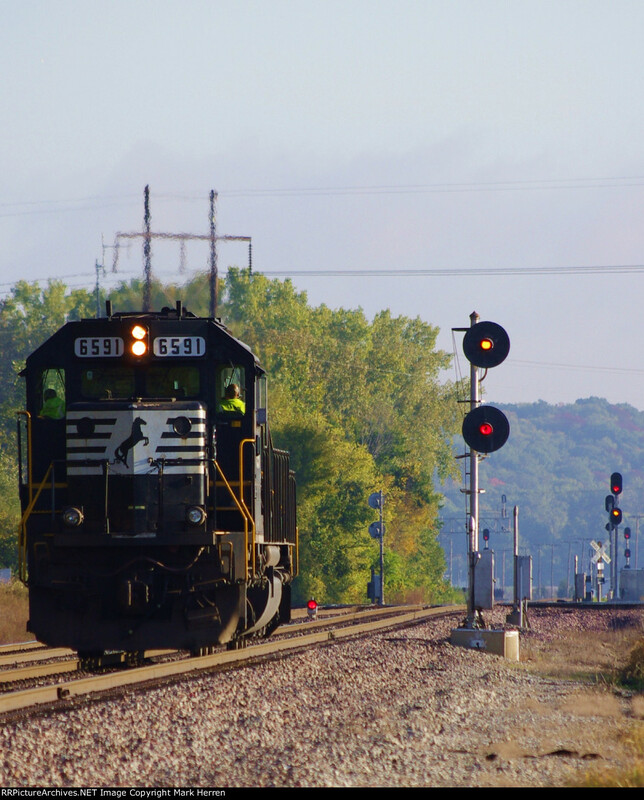 In what might be a new level of laziness Rule 304 "Diverging Clear" actually informs crews that if an intermediate signal does not exist between there and the next interlocking they must approach that signal prepared to diverge as well. So at that moment the engineer must be cognizant of the current turnout speed, if there is an intermediate signal and if not then the next turnout speed as well as any additional speed restrictions which are all recalled from memory. What makes the Southern stand out compared to the traditional Route Signaled lined out west is their use of Y/G for Approach Diverging as opposed to Y/Y on the UP/BNSF systems, instead using Y/Y for Advance Approach instead of *Y*. 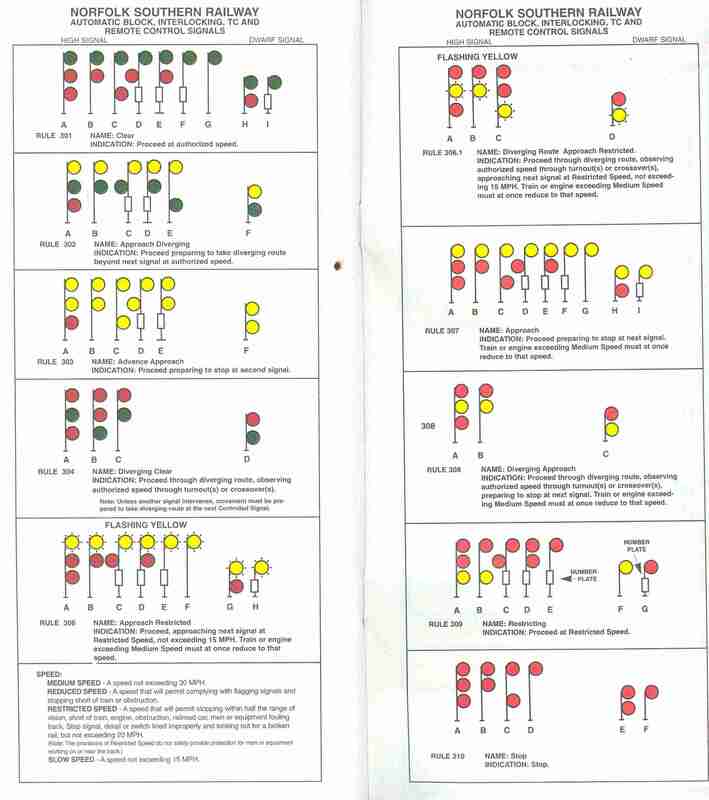 With Y/G a major aspect the system doesn't suffer from yellow overload. There's something about green and yellow that just goes so well together. Another defining feature of the Southern system is the use of bottom yellow Restricting. R/Y won't cut it as that is Diverging Approach. You need either a third head (the preferred method now employed by NS) or a sufficiently large "gap" between the top head and the one below it. Again this requires a bit of route knowledge to prevent mixups. The Southern tended to employ Restricting sparingly, like for movements into yards. Today NS uses it much more frequently. Bottom yellow restricting with a gap in action. However NS generally prefers including the middle head. 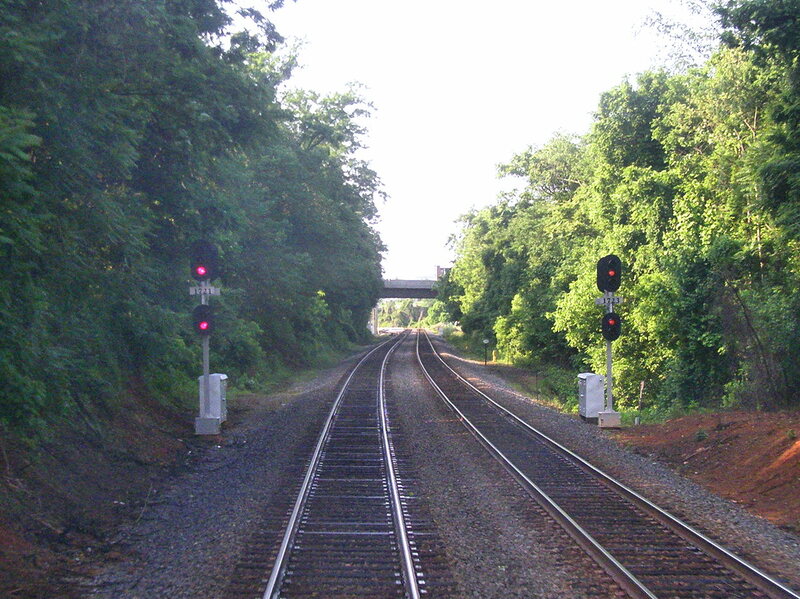 Now unlike Conrail, NS has made no attempt to either mash all of its legacy signaling signals into one unified whole or phase the older styles out. Therefore NS maintains separate signal charts for its Southern. N&W and NORAC zones. Before we go any further lets see how much as changed. I'll make things easier and point out that the only change is to the *Y* indication going from Approach Slow to Approach Restricting. 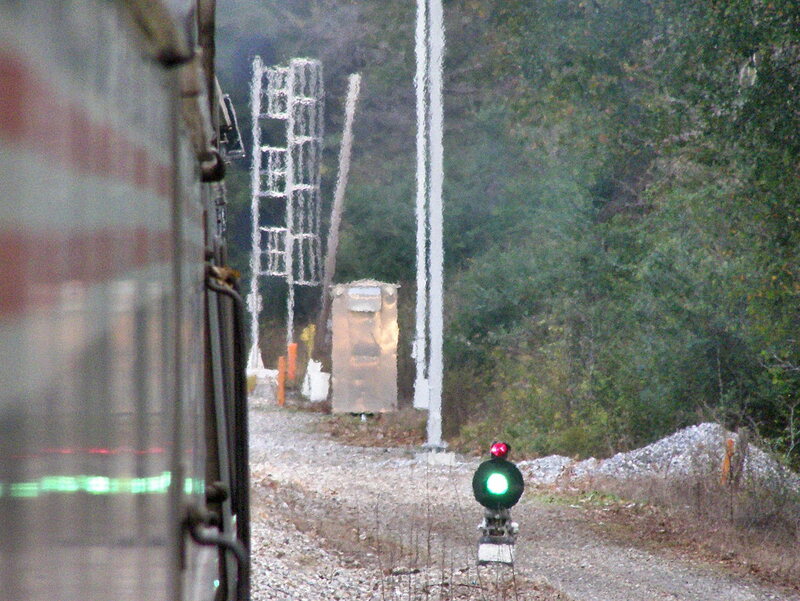 This gives us the opportunity to talk about why the route signaled Southern has this big old speed signal indication in it. Rules 306 and 306.1 were added when flashing relays became available, sort of like Medium Approach on the PRR. 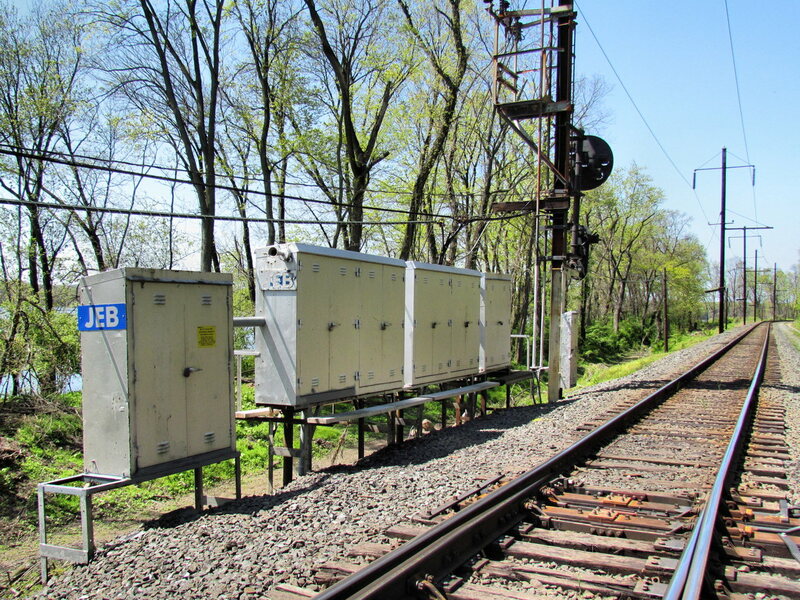 They were needed for the Southern's CTC projects that looked to replace the single track bi-directional ABS lines with manual passing sidings. 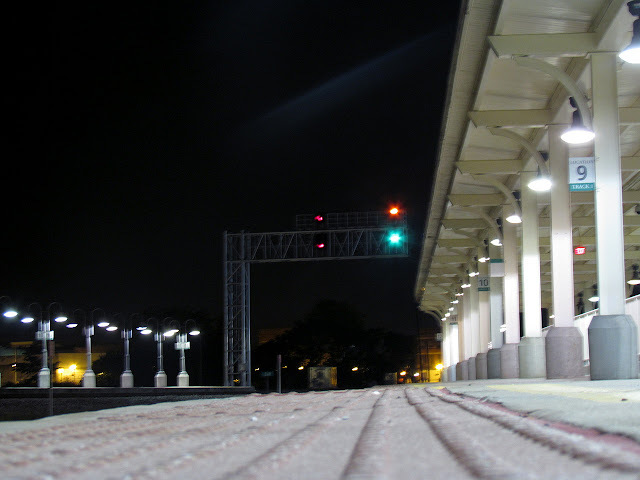 The new CTC sidings were not signaled and thus the need for a new indication was born. By flashing the yellow the existing ABS signals would not need physical modification with extra heads. At some point NS changed the indication from Approach Slow to Approach Restricting since that is the indication the train would be approaching. Another indication that seems to have bitten the dust between 1980 and 1981 is Rule 305 or Diverging Route Clear, Approach Limited. Again this seems like one of those CTC related rules that was trying to fix the problem of back to back interlockings I mentioned before. In this case the Southern used the old Limited Speed Triangle to tell engineers they were diverging into a single block siding and should expect to diverge again. It appears the experiment was a failure as like I said no mention appears in the 1981 rulebook. Moving on to dwarf signals R/Y for Diverging Approach is carried over leaving Y as the main Restricting indication. Fortunately the use of virtual signal heads means that a three lamp dwarf with the order R-Y-G can display R/Y Diverging Approach or Y Restricting. Like NORAC a 4th lamp is needed to display both Clear and Diverging Clear, but instead of G/G, the Southern employs G/R like the Western Roads. All indications have their own dwarf equivalent and moreover with the exception of Restricting all indications' dwarf signals mirror at least one high signals aspect. Even if one of the lamps is clearly more of an afterthought. Well with only 10 signal rules to cover that's pretty much it. Tune in next time for whatever it is I can find photos of. I'm starting a new semi-recurring topic called "Caught on Camera" where I will highlight interesting signal indication not normally caught on camera (still or video). I would usually stuff these into news posts, but I think they should make up their own thing. 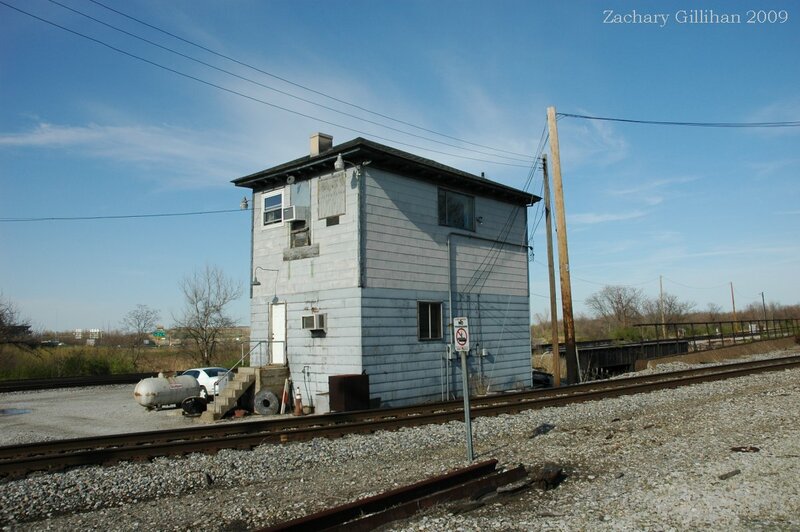 This week I have two examples, one from the NS ex-Wabash Kansas City District and the other is from the former Conrail Detroit Line. 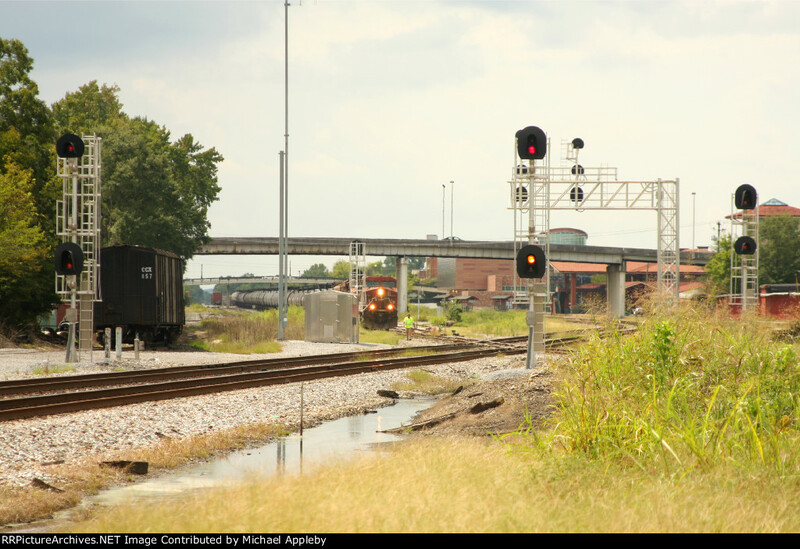 The NS Example is from the BIRMINGHAM (Missouri) interlocking where the the BNSF IC&E line crosses the former Wabash line to Kansas City. Birmingham crossing also marks the start of joint operation under BNSF rules and is also under control from the BNSF KN operator at Ustick "Tower". 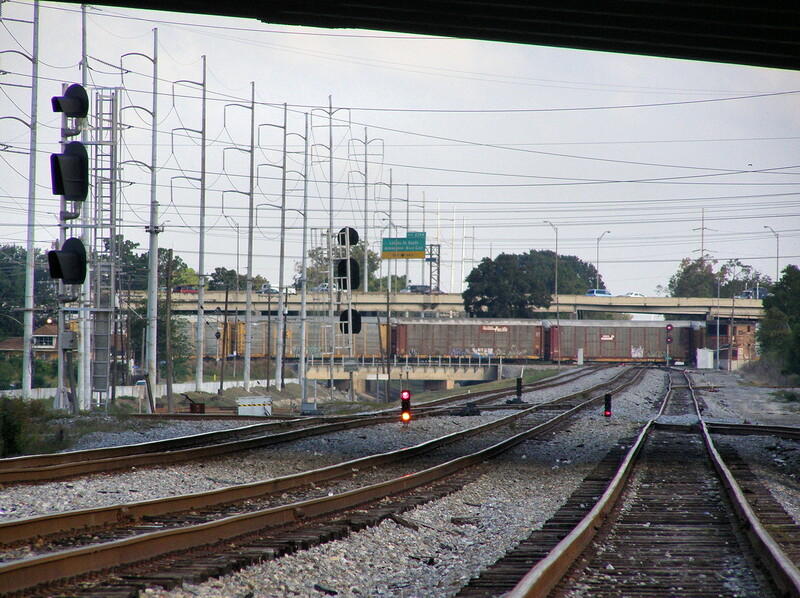 All signal rules and indications in this stretch of track use BNSF rules including the eastbound signals at the Birmingham crossing. In the first photo we see an eastbound NS train wrong railing across the diamonds getting a Y indication on a dwarf signal. However while this looks like a Rule 251 Restricting situation, because of the BNSF rules that train is either getting Approach or Approach Medium (*Y*) since BNSF does not use different dwarf indications. 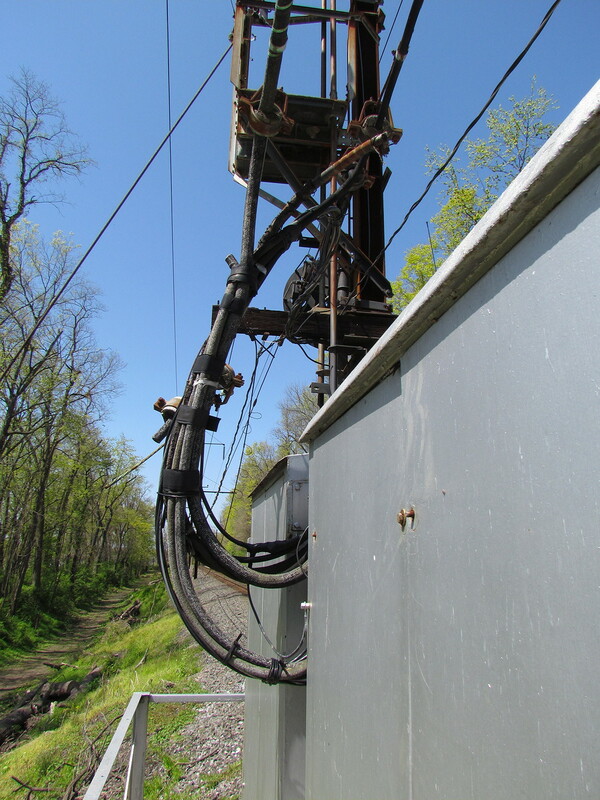 Looking further down in the background we see an NS signal displaying Diverging Clear. Just an interesting situation that is not often captured. 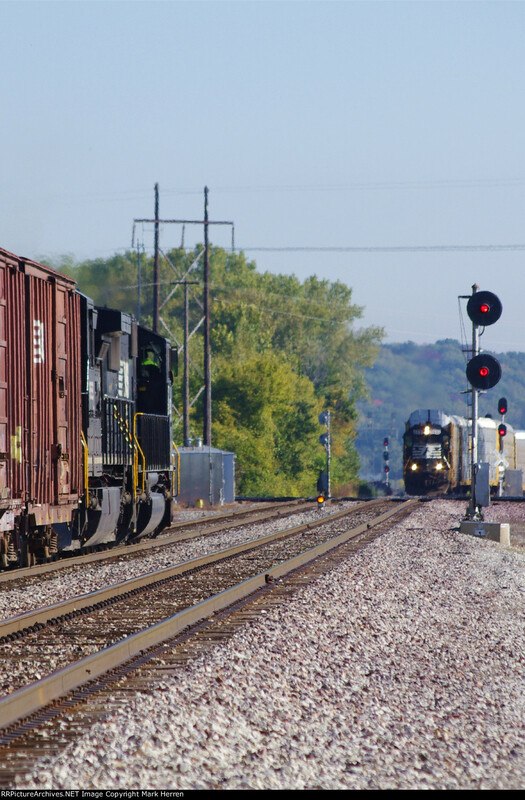 Same location and this time we see an eastbound light engine, right railing this time, getting an Approach indication at the diamonds under BNSF rules, but at the next interlocking we see a Restricting indication as beyond the diamonds NS rules are in effect and NS uses R/Y Restricting. Moving over to the Detroit Line, although technically it is on the CSX (C&O) Saginaw Sub where it crosses the Detroit Line at CP-WAYNE. This is certainly a unique situation where we have a Michigan Central style small target searchlight signal which was used to upgrade the wrong direction route on the C&O line from a dwarf as the original large target searchlight signal can be seen on the opposite track (the C&O Pierre Marquette division used large target searchlights instead of their US&S N style elephant ears). 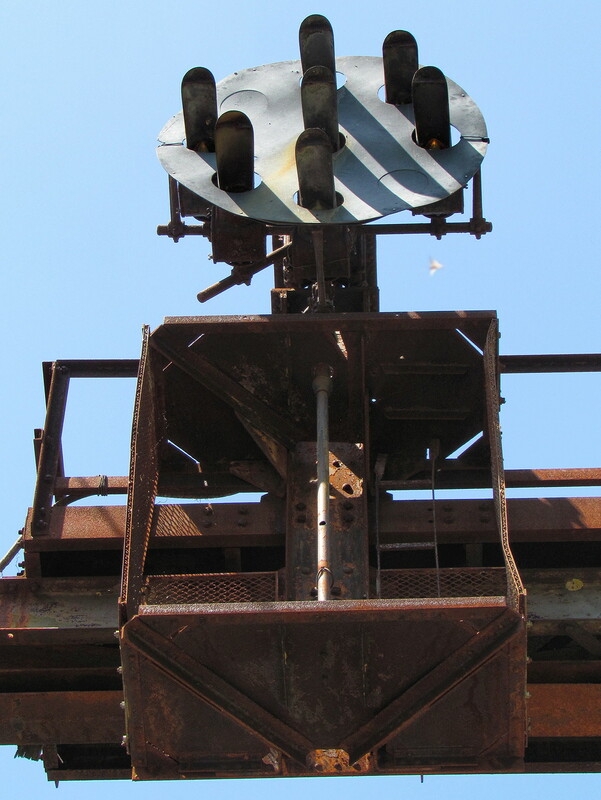 Why would Conrail install this signal? Because crossing at grade bring out all sorts of odd maintenance arrangements and CP-WAYNE is controlled by the Conrail/NS dispatcher. Going by C&O signal rules this would in fact be Medium Approach Slow (assuming that the lower head isn't flashing) so I'm not sure if this this is just some poor substitute for Medium Approach Medium, if the route would take the train over one of the wye tracks and onto the Detroit Line or if the required medium route at NEWBURGH interlocking used to have a slow speed dwarf as a holdover from the 251 days and the CP-WAYNE signal was just never changed once NEWBURGH was upgraded. Anyway, its a great catch of of what is probably a unique situation.